We’re committed to the principles of responsibility and sustainability in the sourcing of our ALDI exclusive-brand seafood. Our approach is based on sourcing our fish and shellfish products from responsibly managed fisheries and farms that have minimal impacts on the wider marine environment and are committed to human rights and fair labor practices throughout the supply chain. The SIMPLE.SUSTAINABLE.SEAFOOD. 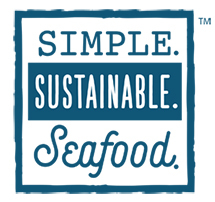 mark on our Fremont Fish Market products, represents our commitment to deliver sustainable products. When you see this mark, you know it is a responsibly sourced product you can trust and feel good about. Third-Party certified as sustainable by trusted independent certification schemes, such as the Marine Stewardship Council (MSC), for wild-caught and Global Aquaculture Alliance (GAA) and the Best Aquaculture Practices (BAP) certification for farmed fish and seafood. Performing to globally accepted measures of sustainability based on available scientific and technical information on the health of fish stocks, the quality of their management and the impact of fisheries on the rest of the ecosystem. Actively working toward certification or in a Fishery Improvement Project (FIP) or Aquaculture Improvement Project (AIP, iBAP) that can demonstrate progress. Learn more about how we source seafood in our Seafood Buying Policy. Sustainable Fisheries Partnership (SFP), a leading non-governmental organization in the field of sustainable fishing, acts as our independent adviser to continuously improve our Seafood Buying Policy as well as provide us with scientific information to assess the sustainability of the fisheries and farms in our supply chain. We are also an active member of the Seafood Task Force, a multi-stakeholder initiative seeking to address illegal, unreported and unregulated (IUU) fishing, to support the effort of resolving the human rights issues and marine conservational problems in the Thai shrimp industry. Information about the sources of our seafood products can be found on the product labeling. Labels include information about the production method (e.g., wild-caught or farmed) and the Food and Agriculture Organization (FAO) Catchment Area (for wild-caught seafood) or Country of Origin (for farmed fish).